A community event in this storied Atlantic Coast outport helped restore a wooden boat from relic to relevant. Just off the jumbled rocky shoreline of Fogo Island, on the East Coast of Canada, Tony Cobb stumbles at the bow of a fiberglass fishing boat as he strains to heave an anchor up through the crinkled steel-blue sea. It’s the second time he’s had to do this today—hernia be damned—and he has to hurry. 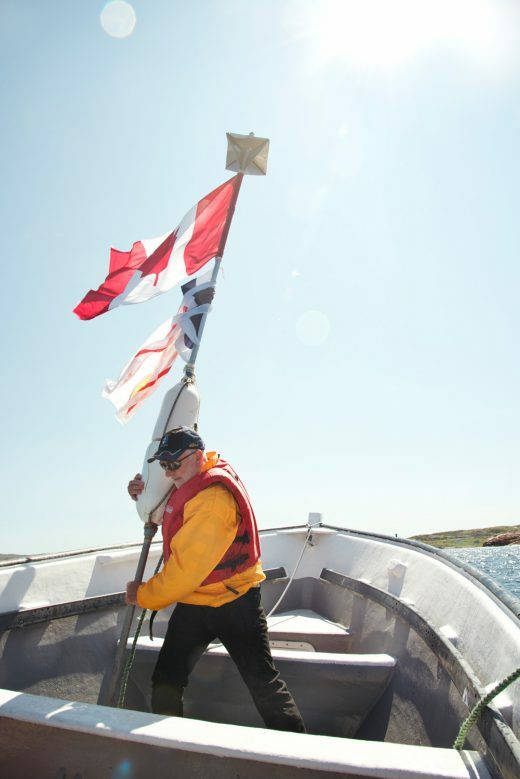 The anchor secures a flag marking the turnaround point for the annual Great Fogo Island Punt Race To There and Back, but “there” needs to move farther up the coast. And the lead race boat has already rounded the point from Joe Batt’s Arm harbor, closing in fast on the flag. “Come on pull, ya bugger, pull! Put your back into it,” a man jeers at Tony from a nearby speedboat, the passengers beside him grinning. “Oh, looks like you got a big one there Tony!” he adds, shouting over the 20-knot winds. “I think I got a big one,” Tony plays along, while wincing from the exertion. Finally, he heaves a concrete block over the gunwale and collapses into a heap of yellow slicker and red life jacket. “Yeeaw, it wasn’t pretty but we got it,” he wheezes. The bystanders cheer. Tony, one of the event organizers, and race water-safety officer Aidan Penton, standing at the stern, had been debating moving the turnaround point to make the race harder for those paddling the punts—traditional solid-wood rowboats moored in Fogo Island history—when a couch-sized vestige of an iceberg plowed right over the flag, as though in a definitive act of divine intervention. Now, with the critical cargo on board, still intact despite the assault, Aidan opens the throttle of his outboard motor and blasts another 500 meters away from the racers to dump the marker overboard and get out of the way just minutes before the lead punt—rowed by a hulking man with volleyballs for biceps and his female partner—catches up. The other nine punts in the race are staggered behind, the coed teams of two accompanied by a flotilla of support boats. One racer frantically hammers part of his boat back in place. Punts are built for continuous work, not high power, Aidan says; racers have to know just how much stress their boats can handle. 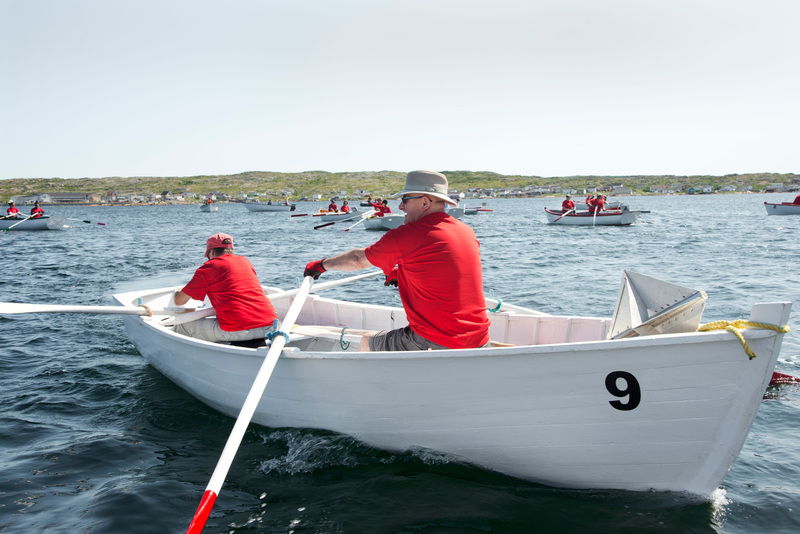 The racers skirt the island’s northern coastline in front of the famed Fogo Island Inn—vernacular but grand with a profile that looks a bit like a small, timber-clad skyscraper tipped on its side—in waters many of their ancestors fished for centuries with punts. Beyond a cluster of smaller islands, the Atlantic Ocean stretches north clear to Greenland. If the island of Newfoundland were a cruise ship, Fogo Island would be the life raft strapped to its deck. 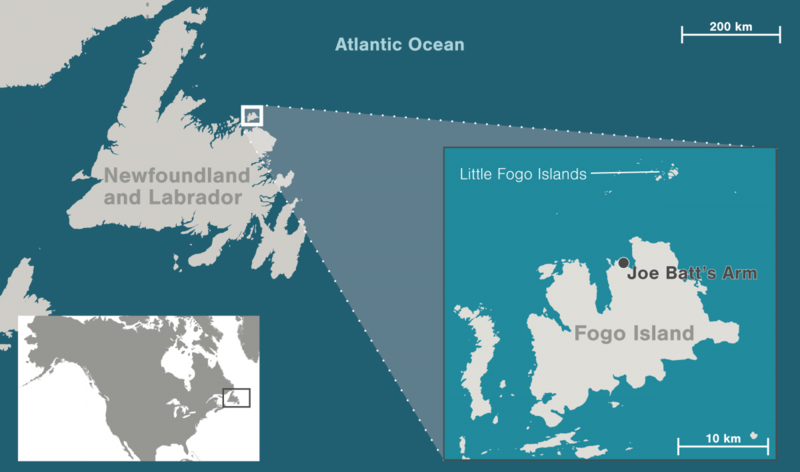 As the story on the rock goes, nature put Fogo Island in place to offer a little protection to Newfoundland, which in turn shields Canada from the tempestuous Atlantic, so those on the mainland could sleep more peacefully. Out of sight, back at the government wharf in Joe Batt’s Arm, one of Fogo Island’s 10 communities, a small but enthusiastic crowd is licking icing off cupcakes (red or white for Canada’s 150th), lining up for hot dogs, and stomping in time to the peppy tunes of local folk band Middle Tickle. Just like the two dozen icebergs shape-shifting in the sun on the horizon, there’s more to the earnest small-town festival beyond the surface: it’s about punts, yes, but it’s also a declaration of pride of place and of a mariner boatbuilding culture created by people tough enough to endure for hundreds of years on this outflung chunk of rock. And, now in its 10th year, the race is also occasion to celebrate that rough economic tides around Fogo Island are beginning to shift. Punts have been a fulcrum of life here since Europeans chasing cod settled on the island, which had previously been used in summer months by the Beothuk people. Without roads or motorized vehicles, the punt, says Aidan, “was everything.” Locals used the utilitarian vessels to get to church or appointments, to collect mail and groceries, to pick up their dates, and, most critically, to hunt and fish. As the island modernized and the nearshore cod fishery collapsed, the punt became a relic. Back in 2006, before business phenom Zita Cobb, Tony’s sister, spearheaded the creation of the luxury Fogo Island Inn, a stylish exaltation of everything Fogo that commands upward of CAN $1,675 per night with surpluses funneled into the community; before Shorefast, a charity cofounded by Zita, Tony, and another brother Alan, launched artist residencies and microlending projects; before Tony and his wife, Janice Thomson, conceived of Fogo Island Fish, a new Shorefast program that’s turning hand-caught cod into a premium culinary commodity while compensating fishermen double the market value; before all that, the Cobbs realized that Fogo Islanders were “only eight funerals away from not being able to build a punt,” and sprang into action. Zita had returned home after a lucrative career in fiber-optics technology, and partnered with her brothers on a mission to affect positive change in the place that had defined their family for eight generations. Their own father had fished from a punt his whole life until the cod stock crashed. He died broken-hearted, they say. Which makes the punt deeply personal. They led development of a punt-building program in the local high school and devised today’s race to help keep punt culture vital. As Zita puts it, a punt “is the most perfect manifestation of a deeply embodied relationship between human beings and the natural world.” There are now perhaps 16 people capable of building a Fogo Island punt, Aidan one of them, and they construct their boats the way their great-grandfathers did. The process starts with a journey into the forest to hunt for trees that have the right natural curves where trunk transitions into root, eliminating the need for steam bending. 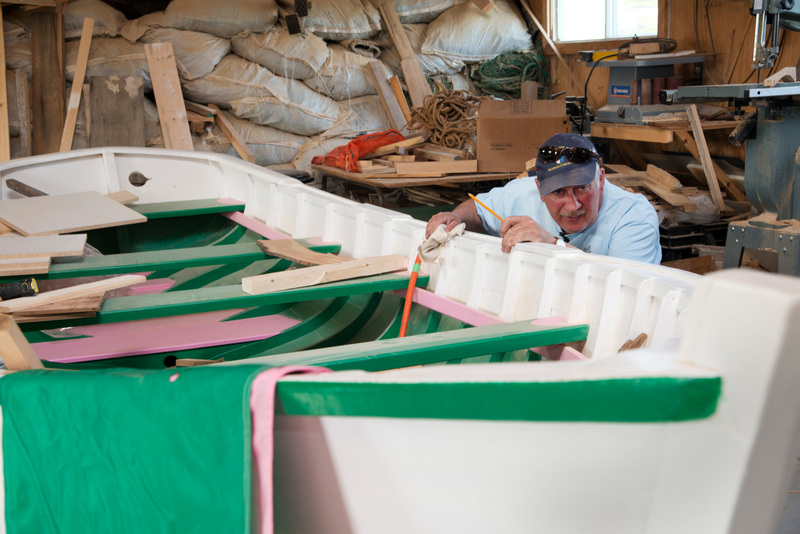 Punts are used exclusively for racing and recreation now, so Aidan likes to make his “cranky”—boatbuilder parlance for tippy—allowing them to move faster. Later, he’ll show me his roomy workshop, subtly perfumed with woodchips and hemp rope, where he’s putting the finishing touches on a boat accented with the pink, white, and green of Newfoundland and Labrador’s unofficial flag. The five-meter-long craft, big enough to hold about six people, looks deceptively simplistic. It is pointed at the bow and blunt at the stern, with gracefully curved sides painted white, like a rowboat from a storybook. But it took roughly 300 hours to build—quick by his standards—each piece fitted into place by hand. It’s the 12th he’s finished, and the 61-year-old expects he’ll have the energy for only one or two more. Back at the pier, an hour after the 200-year-old starting gun fired, Zita helps the crowd welcome the last duos and their punts back to harbor. It has always been a relief to see punts return “safe home,” she says. Today each one in the fleet is a metaphor, representing a liminal space between land and water, and between the past and the present. As the winning teams take the podium, bowing their heads to receive a wooden medallion Aidan carved from Fogo Island wood in his shop, it seems there are multiple reasons for Fogo Islanders to cheer. After four years, the inn is turning a profit; cod, the very foundation of this place, appears to be recovering; Shorefast initiatives are building palpable optimism and have put Fogo Island in the international spotlight. And punt culture is safe home for another day. Travel for this story was via Canada C3, a 150-day expedition along the country’s three coasts in honor of the 150th anniversary of confederation. 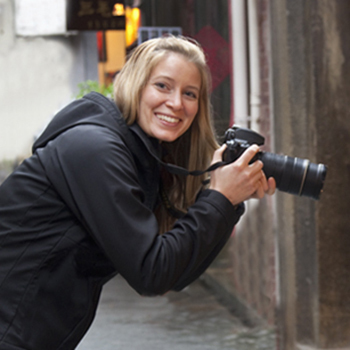 Shanna Baker was a participant on leg five. Cite this Article: Shanna Baker “The Race That Saved the Fogo Island Punt,” Hakai Magazine, Dec 20, 2017, accessed April 23rd, 2019, https://www.hakaimagazine.com/features/the-race-that-saved-the-fogo-island-punt/.